I really like it, topic subscribed. Pls post the URL of a demo board once ready. Topic: How to retain custom forum logo-icon when updating phpBB? Re: How to retain custom forum logo-icon when updating phpBB? First post updated with link to demo. Theres still some things to do and a few 'done' things to change, most noticable are the forum icons - they are based on the original phpBB2 icons but I think the grey needs to be darker as they're hard to see. Topic: How to publish my theme on phpBB styles? 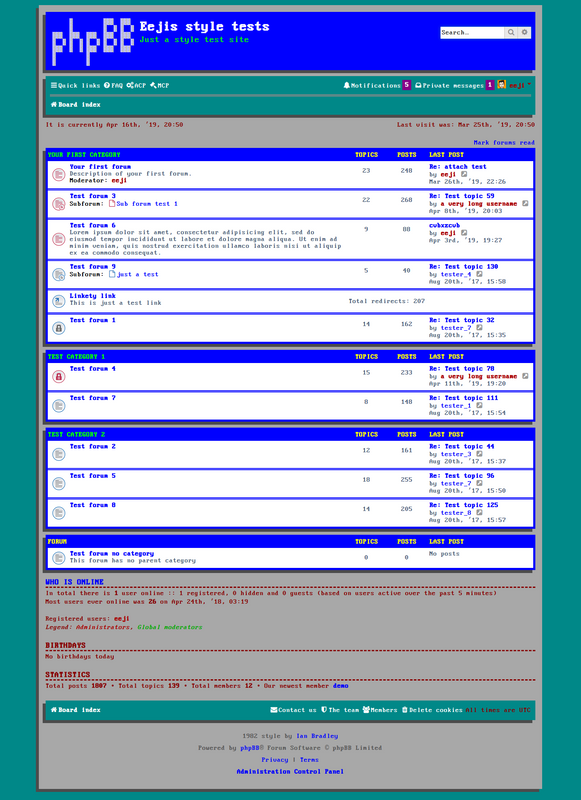 Re: How to publish my theme on phpBB styles? And here I just updated to 3.2.4. I take it I need to wait for the styles I use to update? There is only one small change in the style, so 3.2.4 styles will still work in 3.2.5. The change adds a class to the text box in the contact us page so it styles correctly.